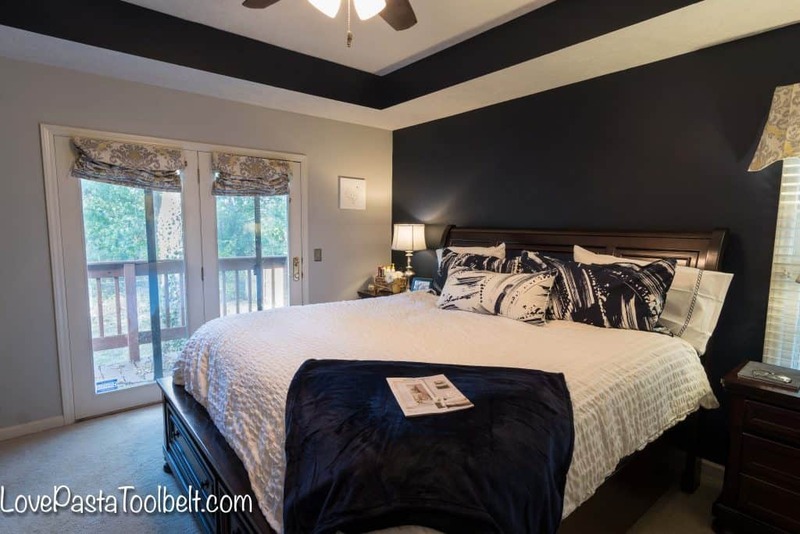 This Navy and Gray Master Bedroom Design was sponsored by Annie Selke as part of an Influencer Activation for Influence Central and all opinions expressed in my post are my own. You guys, my husband is the best. The poor guy, I am always coming up with a new design for our house and he usually goes right along with it. Whenever I get the urge to paint, or in this case repaint, a room he graciously agrees to indulge my design dreams. A few weeks ago, I told him I had a vision for our bedroom. I have been obsessed with navy for a while now and have incorporated it into parts of my house pretty successfully but not on my walls, until now. And after this room was done my husband said never again on the dark paint. 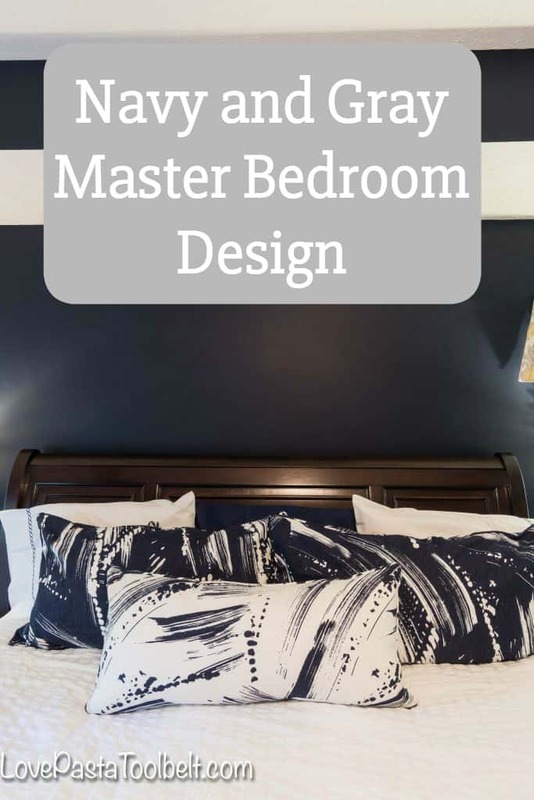 I’m so excited to share with you our Navy and Gray Master Bedroom Design. I love the look of navy and gray together. I think they compliment each other so well and that’s the color scheme I wanted to follow in our master bedroom. So we started out with paint colors. Repose Gray from Sherwin Williams is our go to gray. It’s in K’s Nursery, our guest bathroom and our master bath as well as our stairway. It’s the perfect gray for our house. 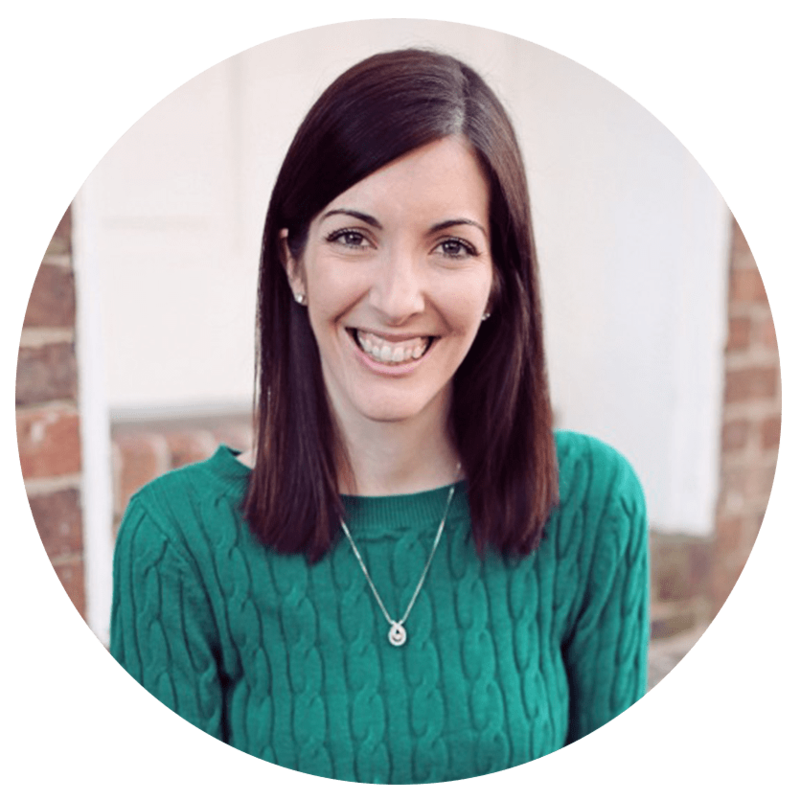 When it came time to pick a navy paint color I had chip after chip to choose from but when we received our beautiful shams from Annie Selke I knew immediately that Anchors Aweigh from Sherwin Williams was the paint color. Tyler set off painting our master bedroom and started out doing one wall a weekend. This past weekend while I was out of town, he was kind enough to finish off the gray and then add the navy to the wall behind our bed and also on the tray ceiling. I was originally thinking white for the tray ceiling, but the more gray we got in the room the more we knew it needed more color, so Tyler came up with the plan to put navy up there as well. It was a great choice! I have been itching to get some white bedding for awhile now. With a black lab I wasn’t sure that was the right choice, but since she’s not allowed on our bed, I decided to just go for it and keep my lint roller handy. I turned to the Annie Selke fall catalog for inspiration! 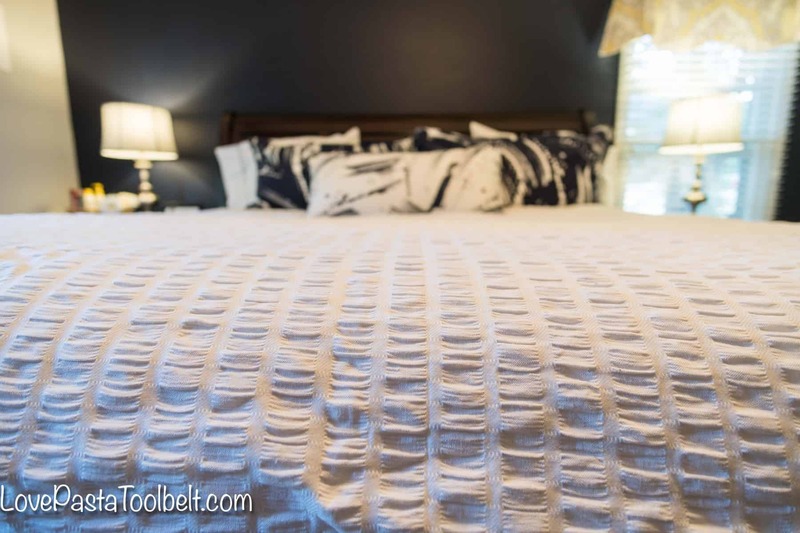 I chose a beautiful white duvet cover from Annie Selke. It is fresh and clean looking and adds the perfect contrast to the dark blue wall and our dark wood bedroom furniture. I love the texture of the duvet and what it adds to the room. 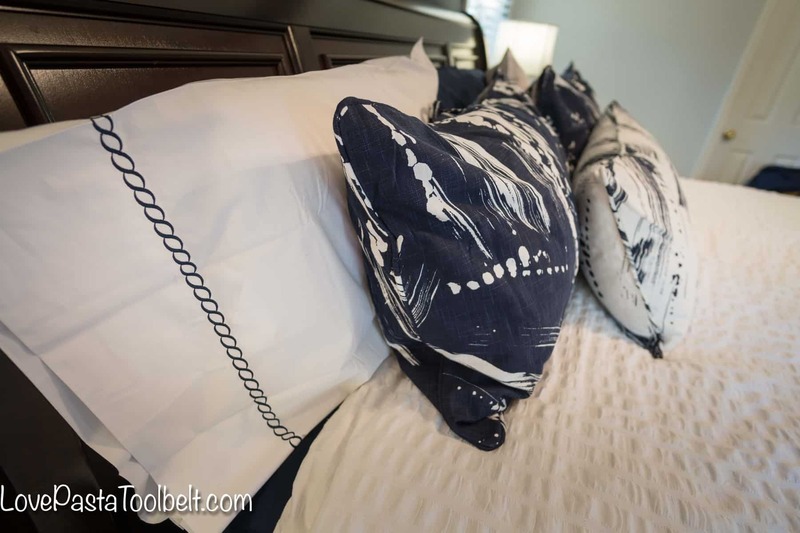 To compliment the white duvet cover I added in some beautiful navy blue pillow shams. I love the brushstroke looking print of these pillows and also got a white one with the blue pattern for another pillow. I got some crisp white pillow cases with the pretty navy blue design detail on them from Annie Selke as well. I finished off the design with navy blue sheets, a navy throw blanket and a navy blue bedskirt. Can you tell that I really love navy blue? When we added all of the accents and bedding from Annie Selke, the first word that came to both of our minds was luxurious. We love that our master just feels so luxurious but in a comfortable and very cozy way. After having been gone for over a week, it was the perfect welcome home to climb into my own bed in my beautiful new master bedroom! 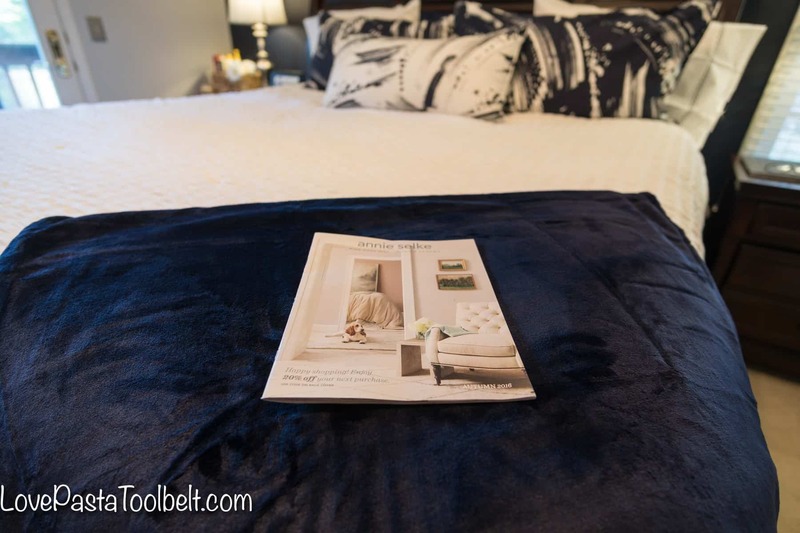 So if you want to purchase some of these items from Annie Selke or some of their other beautiful items you can enter to win one of three $500 gift cards and get started on your room remodel! Also be sure to sign up for their fall catalog and newsletter when you enter so you can see all of the beautiful things they offer!